Dark skies, foreboding seas and lots of Scandinavian decoration can only mean one thing – this is a game about Vikings and frankly, those notorious pillagers and marauders are always a welcome addition to any online slot. 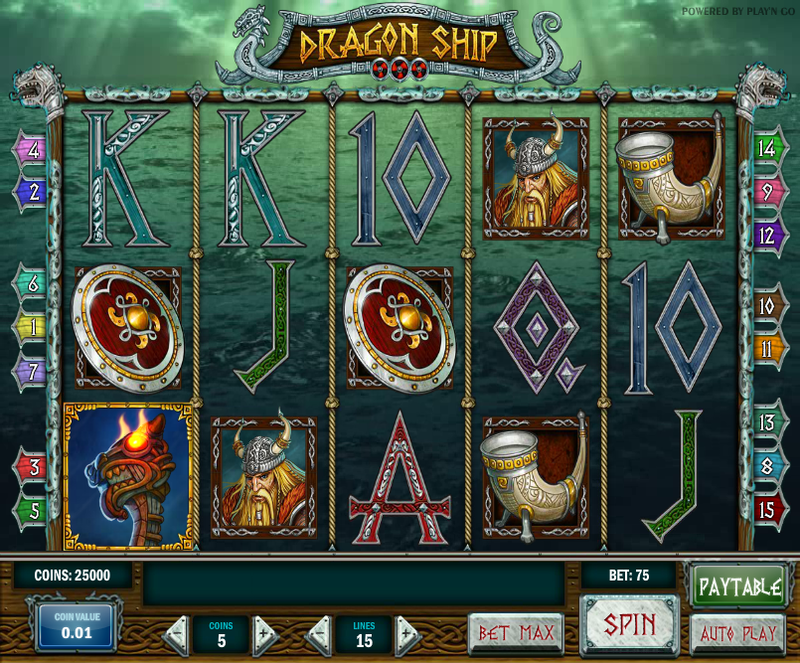 Dragon Ship is a superb looking release from Play N Go with some great animations and even better sound effects. 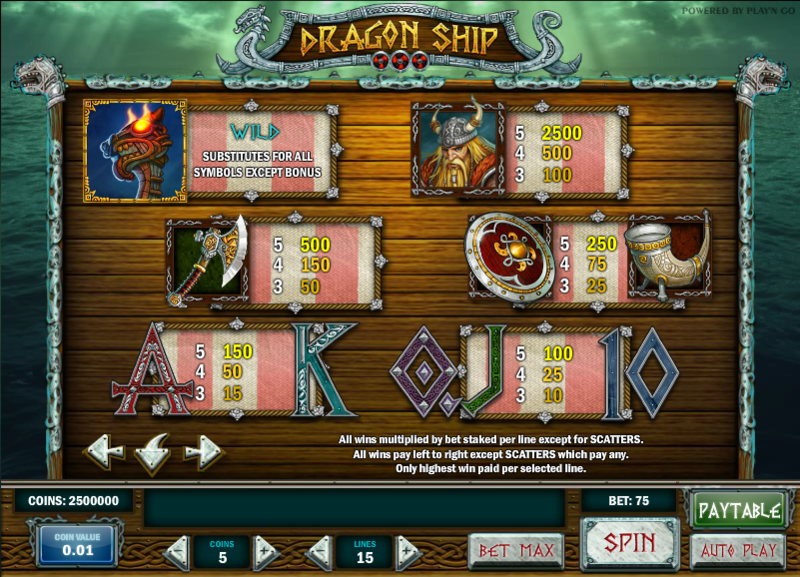 Dragon Ship is a five reel and fifteen payline slot with some of the highest quality graphics you will see; the background to those transparent reels is a real sea underneath a cloudy sky and it provides the perfect atmosphere to this brooding game. Playing card symbols make up the lower values on the reels but the higher values are all Viking-related and include a ceremonial horn, a shield, an ornate battle-axe and of course a blonde-haired Viking. The wild symbol is the prow of a longship which only appears on reels one five and can be stacked; the golden treasure chest is a scatter symbol appearing on reels one, three and five only. The wild symbols are stacked on reels one and five and you need to completely cover those two positions to trigger this feature. You will now receive fifteen free spins but the good news is that reels one and five remain completely wild for the duration of this round – the bad news is that this feature cannot be re-triggered. Check it out in the video below. You will need to land three of the treasure chest scatter symbols on reels one, three and five to trigger this feature and it’s over fairly quickly; all you need to do is select one of the chests on show for a lovely coin prize. After each win it’s possible to gamble that money by clicking the ‘Gamble’ button underneath the reels; you can try and double or quadruple your winnings by correctly guessing the next card colour or suit drawn from the pile. Always use the gamble feature with care; betting your winnings every time is the fastest way to lose your bankroll. This is great-looking game with some outstanding graphics; superimposing the reels onto a real video of the sea works well when it could so easily have gone wrong.